TANK GIRL POSTER MAGAZINE EXTRA! NOW ON SALE! GET A SIGNED TANK GIRL POSTER PRINT FOR A BARGAIN PRICE! I’ve been working out this one for a while, after a few readers have told me that they can’t afford the regular poster magazine. I’ve designed this to be as accessible as possible, delivering a signed, double-side A3 print, a 1″ button badge (featuring the original TG logo), and a double-sided A4 print, all for under £5! And that’s not all… because of the lower weight, we can send you two copies for only £7.99 – that’s only £4 each! See the BUDDY PACK OFFER, and get one for you and one for a friend (or one to keep and one to stick on your wall). LIMITED TO 300 COPIES. And remember, all extra items will be combined for a lower shipping rate. 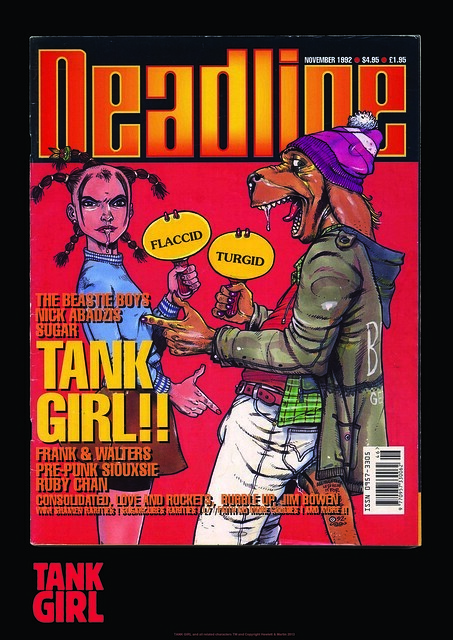 Author AlanPosted on December 15, 2013 Leave a comment on TANK GIRL POSTER MAGAZINE EXTRA! NOW ON SALE!